In my article about the changes coming with Google’s Enhanced campaigns, I discussed the new features and abilities that will be implemented across all campaigns in Google Adwords this month. I have received a lot of questions about the benefits of the new site link extensions and the best way to manage those for different accounts. While every campaign is different and should ideally be customized based on company goals and site type (service, e-commerce, informational, etc. ), I’ve put together a list of the main benefits and how to use them. The Big Bang Theory or the Garden of Eden? Whether your beliefs supports science, the bible, or some other foundation, site-link extensions all come from the same place: the Ad Extensions tab in Google Adwords. For accounts that are just upgrading to the new campaign style, you can view your sitelink data in the “upgraded” view or “not upgraded” to see the data history of your extensions. For those accounts that are just adding extensions now (tsk tsk) this is where you can add in some new, targeted, site-link extensions. I know that it may seem like an attractive idea to simply create campaign level extensions (much less time commitment) but utilizing the ad group level will help you create the most targeted, relevant, and potentially profitable ads. 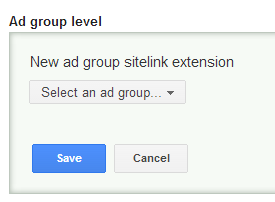 Create extensions at the ad group and campaign level for more targeted ads. Schedule extensions for different times of the day or days of the week. Select mobile preferred site-link extensions to include location text or other mobile targeting terms. Get extensions reviewed for eligibility individually. Keep extension history across changes, don’t lose click data when you edit individual sitelinks. Monitor individual site-link extension performance for better optimization. Take Londes Digital Marketing for example. We run sitelink extensions in our ads. Before the enhanced upgrades we basically had 1 set of sitelink extensions on all of our ads that outlined our core services. Now we are able to customize that at an ad group level and display extensions that have specific, relevant information on each of our services. For example, in the PPC ad group we can advertise “Product Listing Ads,” “Merchant Center Management,” “Display Advertising,” “Remarketing,” etc. Similarly, if Google doesn’t like my Merchant Center sitelink (they’re a bit finicky about using the word “Google”) then just that individual will be disapproved, leaving my others sitelinks free to run. I could go on and on about the flair, but I think you get the point (and if you don’t, feel free to hire me to run your campaigns for you 🙂 ). Take full advantage of the flair to optimize the new sitelink extensions. The campaign extensions may be upgraded but optimization strategies remain the same, so check out my article on generating ROI from your PPC text ads.